When you make a purchase of an app on the iPad, the next time you sync, the app moves over to your desktop iTunes. If you buy an app through your desktop iTunes, you can sync to load the app onto your iPad… or you can go to your iPad and load it directly through the iTunes Store app. The bad part about buying an app on the desktop, then downloading directly through the iPad’s iTunes Store is that you have to tap the ‘buy’ button. This is assuming you purchased the app through the desktop iTunes store that is on the same Apple account as the iPad is. When you tap ‘buy’, your asked if your sure you want to buy. Then, when the app is about to start loading, a pop up window appears saying that you already own the app, would you like to install for no additional charge. For us, every time we go through that step, we hesitate thinking we might have chosen the wrong app and are in fact getting charged for something we may not want. Today we noticed a change to the iPad’s iTunes app store experience. 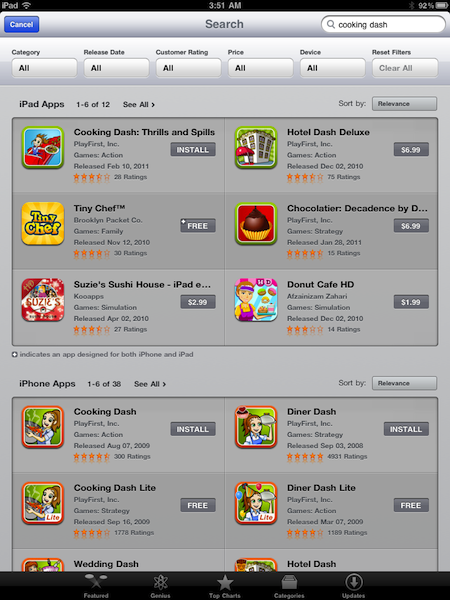 As you can see from the screen shot below, we searched for “cooking dash”. The resulting screen we were taken to has a bar of options to narrow our search. And, next to Cooking Dash we have a ‘Install’ button rather than a price. We know right away that the app is the one we purchased on the desktop iTunes and we are good to download and start using. It’s the little things Apple does that make our lives easier.